"On Sunday, October 3rd, my boyfriend Glen and I decided to take a ride from Missoula, MT to Ovando, MT. On our way back, we headed south on hwy 200. I was looking around at the gorgeous scenery when Glen started to slow down as he saw a truck stopped in front of us. We stopped behind the truck and saw a bull elk approach the truck. The person in the truck must have had some food because the elk jumped up on his hind legs and peered in to the drivers window. (I have that on video as well) Then the elk jumped down and started to approach us. There were two actually. One was a bit smaller and had different looking antlers. I am not much of a hunter so I don't know why they appeared different than the other. I was surprised that the elk came so close to us and I could feel a great deal of tension between us and the animal. 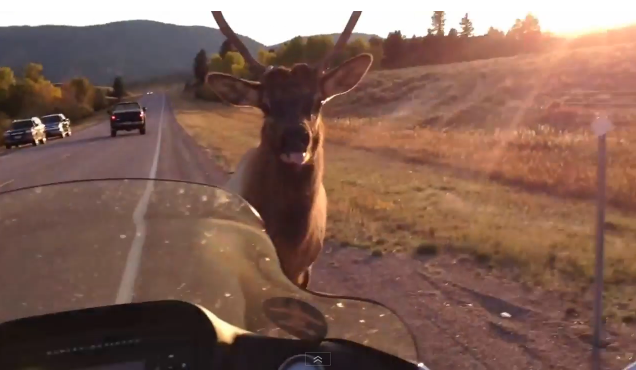 I am willing to bet that if Glen hadn't hit the throttle when he had, that elk would have jumped up on us. The elk chased us for a while and I don't know when he would have stopped hadn't I told Glen to lose it. I didn't want the animal to chase us on the road and put it in any danger so losing it seemed appropriate. I had enough excitement for one day!"